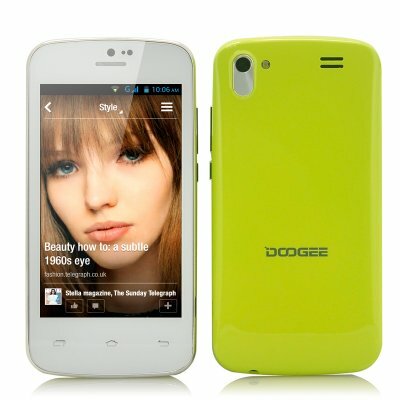 Successfully Added DOOGEE Collo DG100 Android 4.2 Phone - 4 Inch IPS Screen, 1.3GHz Dual Core CPU, Dual Camera (Green) to your Shopping Cart. 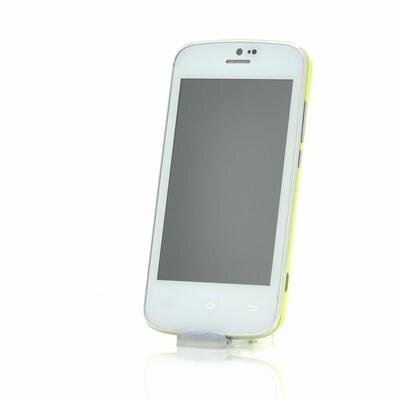 Budget 4 Inch Dual Core Android Phone with 800x480 IPS screen, 512MB RAM and Dual SIM card slot. This well equipped phone is now available at an all-time low wholesale price. Colourful Smartphone to Brighten up your day! The colorful DOOGEE Collo phones have arrived at Chinavasion! Being stylishly colored phones, the Collo phone range offers affordable Android phones with Dual Core CPUs and IPS screens at unbelievable low prices. Now available in a lime green color way, the DOOGEE Collo Android Phone is designed to stand out from the rest. Not only colorful, the DG100 is loaded with specs and is extremely budget friendly. Experience all your multimedia on the bright 4 Inch IPS screen, slide trough content with ease thanks to the touch screen capacitive technology and multitask without lag. With Android 4.2 Jelly Bean preinstalled, the Collo DG100 is packed with marvelous features and abilities. Customize your home screen to your likings, download thousands of apps, games, movies and experience an ultra intuitive form of navigation. Coming with both a front and back camera, the Collo phone will bring out your inner photographer and let you snap pictures or video chat. In the box you will find even more goodies such as a protective flip case, a screen protector and quality earphones. In stock now, the budget friendly DOOGEE Collo DG100 is now available for shipping within one working day and comes with a 12 month warranty. Brought to you by the leaders in wholesale electronics and Android phones, Chinavasion. Real good phone for this money, I love it!!! Best price/value ratio! I can't upgrade the pre-installed Skype to the latest version. The pre-installed version works, but it's only v2.9. Any help or suggestion? Fast Shipping! Amazing Phone! I Don't get the tracking no. but it was delivered by fed ex. worth the money! thanks Chinavasion! Great phone for the price. Easy to set up and comes with a nice cover. Would definitely recommend. Nephew picked up this phone thinking it was his (he has a Samsung) - cost twice as much! Sehr gute Verarbeitung muss ich sagen. Die Qualität für diesen Preis ist auch richtig super.